I’ve found this simple exercise to be very helpful in finding freedom from unhealthy old thinking and old ways. Think of the main negative emotion you’re experiencing lately. It could be worry, fear, anger, sadness, insecurity, jealousy, loneliness, resentment, shame, etc. Now ask God to help you remember the very, very first time you ever remember experiencing the same emotion. Many women can trace that emotion back to their toddler years or grade school years! Now take a moment to consider the event that prompted that emotion. Did someone say something to you? Did a situation cause that feeling? Once you’ve identified the event that prompted this feeling, ask God to reveal whether you began believing a lie about yourself or other people as a result of that event. Remember, Satan is described by Jesus in John 8:44 as “the father of lies“, and he likely whispered a lie in your ear about that event. For me personally, I have wrestled all my life with the dysfunctional tendency to avoid conflict and ignore serious problems in relationships. So, I tried this exercise. I realized my main negative emotion is fear. As I pondered this with God, I realized I first started feeling that emotion as a toddler in a home where there was tons of yelling and verbal abuse. God helped me see that the lie I believed back then was that somehow I needed to find a way to make the yelling stop, and that keeping everyone “happy” was my responsibility so that things didn’t spiral way out of control. But that thinking was a lie! It wasn’t my responsibility then and it isn’t my responsibility now! Have you been believing a lie all these years? Has it affected your decisions? 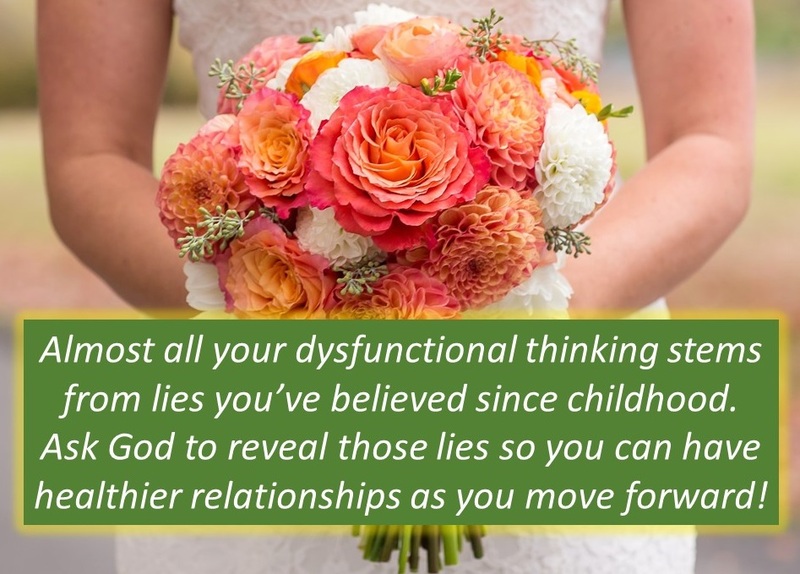 Has it resulted in dysfunction in your life? Ask God to reveal the truth about who you are. Ask God to give you right beliefs to overcome the lies of the enemy!